You’ve heard so much about her so for my ‘Small Stone’ today I thought I would share this picture of our Yacht ‘Red Dawn IV’. 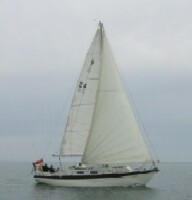 She is a Barbican 33, so she is approximately 33 ft long (9.96 meters). You can just make us out in the cockpit! We are still on board and will return home at the weekend. Unfortunately this means we will miss watching the Olympic Games opening ceremony on the TV this evening and will have to catch up later on ‘iplayer’!